Citronella Oil (Indonesia) - Ultra International B.V.Ultra International B.V.
Citronella oil is extracted from a grass (Cymbopogon winteranus) native to Sri Lanka and Java (Indonesia). 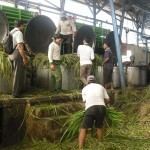 The species Cymbopogon winteranus is used for the production of citronella oil by steam distillation. Citronella is commonly used in soaps, candles, perfumes and other products in the cosmetic industry. It is also a plant based, non toxic insect repellant, registered for this use in the United States since 1948. You will find it listed in many topical products. As a perfumery ingredient it has been historically well represented due to its citronellal, citronellol and geraniol content. Often referred to as 'Citronella Oil Java Type' due to its origins. Indonesia is the second largest producer behind that of China. It is estimated that the total world production of citronella is around 4,000 tons with China and Indonesia representing a 40% share of this volume. Historically China has had a lower cost basis for this product and as a result is the dominant producer, however that is changing, so keep an eye on our market updates to find your most competitive source.